The list of new lifts built in the Midwest since I started this website in 2015 is short. 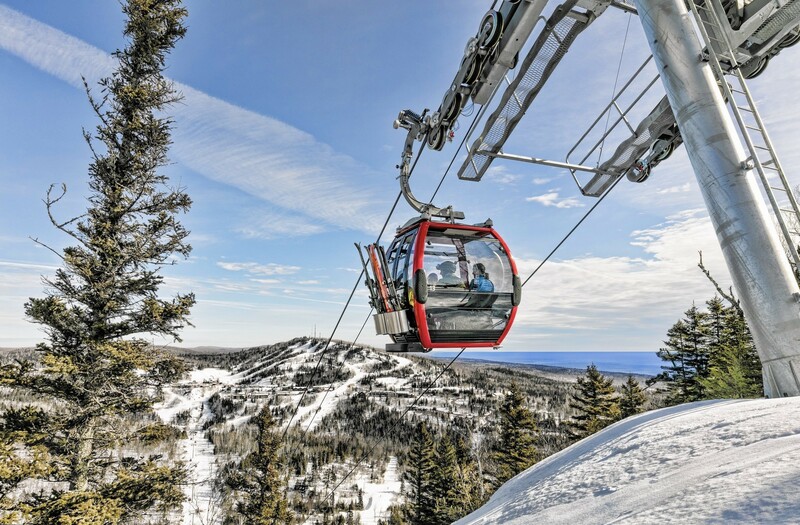 In Minnesota, a total of three – two quads at Giants Ridge and an $8 million gondola at Lutsen Mountains. Unlike both of its state-owned regional neighbors, Lutsen is a family business that also happens to be the largest ski resort for 2,000 miles between the Rockies and the Adirondacks. I’ve never been to this corner of Minnesota but it looks totally beautiful, surrounded by National Forest on three sides and Lake Superior on the fourth. Lutsen Mountains currently includes seven lifts on Moose, Mystery, Ullr and Eagle Mountains. Two are brand new and three older chairs were recently retired. The co-owners are on a public outreach tour as they embark on a rigorous approval process with the United States Forest Service. 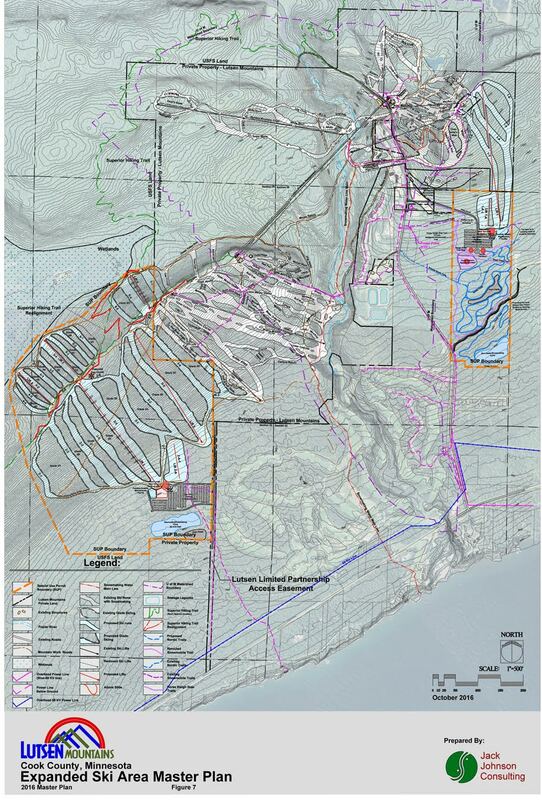 If granted a special use permit for new ski terrain in the Superior National Forest, it would be the first brand new permit for a U.S. ski resort in decades. “The only available land for us to have more runs is federal land,” Skinner pointed out along with the fact that 90 percent of Cook County is publicly-owned. 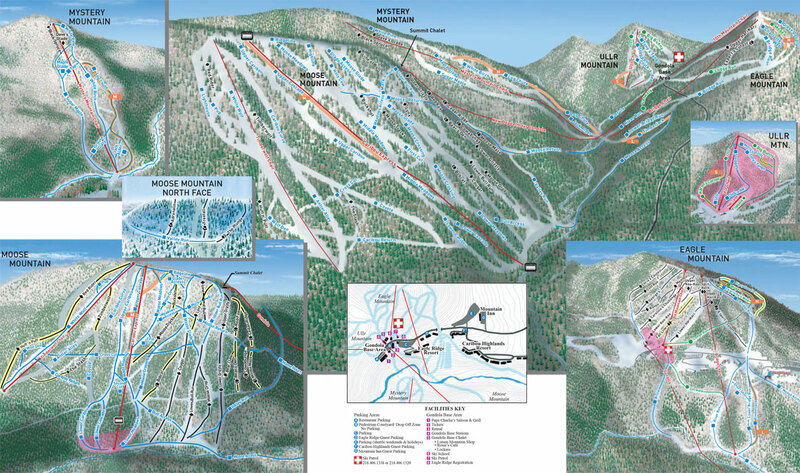 The expansion plan would first add 100 acres of much-needed beginner terrain with skier services on Eagle Mountain serviced by a new chairlift. Depending on the cost of a new lift, Lutsen may use one of a few retired lifts it has in storage. The next phases would add 400 acres of intermediate and advanced terrain on two sides of Moose Mountain including glades and up to six new lifts. “As the ski industry moves forward, we need to be larger in order to survive,” said Skinner, noting the eventual goal of doubling skier visits. The overwhelmingly positive presentation highlighted Lutsen’s vital role in the local economy which is otherwise summer-focused. 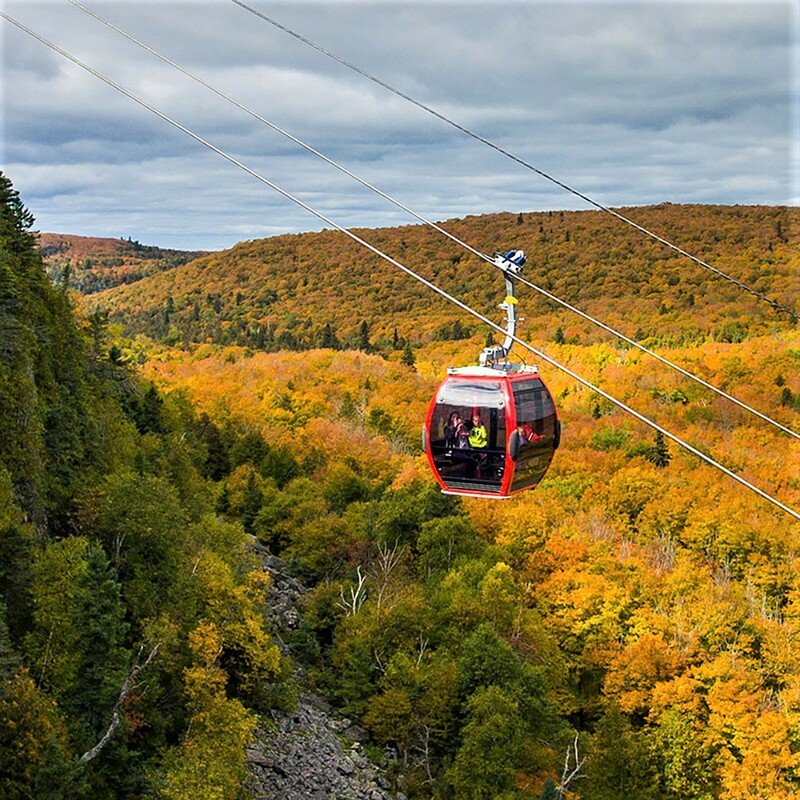 Charles joked that his father, who installed numerous recycled lifts from other mountains at Lutsen, would be “scared to death of the debt” required for projects like the new gondola and probably wouldn’t have accepted the risks. “The gondola has been a good move for us. It’s increased our summer business and strengthened our weddings,” the younger Skinner emphasized before saying loans for further expansion would be personally guaranteed. There is a long road ahead before any new lifts start spinning. The Forest Service just accepted the master development plan for consideration and it will take two years or more for review. “There’s been nothing like this in this region.” said the other co-owner, Tom Rider, in a radio interview, noting the Superior National Forest is struggling a bit to find the expertise for studying a ski plan without any experience. Many lift projects in other forests these days undergo an Environmental Assessment (EA) or Decision Memo (DM) but this will be a full blown Environmental Impact Statement (EIS.) Lutsen and its owners are committed to the thorough process and environmental stewardship but will need the public’s support. You can keep up to date on this exciting project via the Lutsen Mountains and Forest Service websites. As a Minnesota skier/rider (I just skied Lutsen last week) thanks for posting about this. The North Shore of Superior is truly one of my favorite places on the planet, in just about any season, but winter especially. As a Midwest skier from Ohio, I want Lutsen to succeed. Most of the people who I have spoken to, who have been there love it! This is just another reason why you should come to the Midwest soon Peter! Thanks for covering this, Peter. It’s great to see the Skinner/Rider family thinking ahead and pursuing such an ambitious plan. We’ve seen a few of the smaller destination resorts in the Upper Midwest close, while many others seem as though they would be unable to replace their infrastructure if/when it comes time to do so. I was surprised to hear that they would consider putting one of the old double chairs back in for the Eagle expansion rather than a new lift. The Skinner/Rider family also owns Granite Peak, where they’ve invested in three detach chairs. Perhaps the fact that they’re considering that indicates that there may be a detach replacement coming for Bridge Chair sometime prior to the expansion? Ullr Chair was down for several weeks at the beginning of this season, I’d hate to see that happen with the (I believe to be) similarly-aged Bridge Chair. Given the beginner and low intermediate terrain that the new lift on Eagle would serve (and the terrain is MUCH needed there! ), the lift really should be a detachable for friendly loading and unloading. Lutsen’s first priority should be replacing two of its most heavily used aging lifts. Bridge should be replaced with a high speed quad, Ullr with a 3-4 seat Skytrac. I’ve been glad to see them invest in the gondola and the 6-pack on Moose, but improving the uphill experience and overall image for their existing terrain seems like a no-brainer instead of using resources to put more rusty Riblets and Yans back into service for new terrain. If Lutsen wants to be the Vail of the Midwest, it should focus on having more of the actual lifts you would ride at a Vail-like resort. Agreed. I hope they are planning the phasing of this to accommodate improvements to their existing lifts where needed as well, but the comment about installing one of the old doubles on the back side of Eagle makes me unsure. Do you happen to know what years Bridge Chair and Ullr Chair are? Best I can tell is they date from the mid-70s or earlier. After the extended downtime that Ullr had at the start of this season, I hope Lutsen is thinking very hard about the reliability of these older lifts. I think Ullr is a 1972. Not sure about Bridge. According to the Skilifts.org lift survey, two Riblet doubles were installed in 1972 – one with ~275′ vertical (Ullr) and another with 616′ (either Mystery or Bridge). Another Riblet lift was modified in 1974. I do know that at one point the Ullr lift ran a different line all the way to the valley floor. Not sure when that lift was modified. I think the key is that at the size of Lutsen + Granite Peak there is a limit to the capital expenditures (or additional debt beyond the gondola financing) this relatively small outfit can sensibly risk. Eagle also doesn’t really have the vert or slope length to *need* an HSQ. The Bridge chair should be upgraded to a quad, and the new Eagle beginner terrain lift would be far better served with at least a triple (allows two young learners per adult on the chairs). Can they swing it financially, though. You are certainly correct that Bridge doesn’t need a HSQ, but installing an HSQ in its place would not be out of line with regional trends. Other larger ski areas in the region are installing detach lifts on relatively similar alignments. Of the 9 detach lifts that exist in Minnesota and Wisconsin, 8 serve less vertical than Bridge, and 3 are shorter in length. I agree with this assessment, and I would point out that replacing the Bridge and Ullr lifts could happen irrespective of the decision on this plan – we could see those lifts replaced before the EIS is even complete. Bridge Lift needs to become a HSQ to deal with the capacity issues created by removing Eagle and funneling all the traffic from skiers returning from Mystery and Moose to one lift. With a mid-load station for the alpine slide, it would be much more skier-friendly than the existing center-pole double. Ullr should be replaced by a fixed grip quad, probably from Skytrac. The carriers on Ullr make it difficult for beginners to load; the location of the base is not ideal based on the configuration of the runs it serves. I hope to see both of those lifts replaced sooner rather than later. I would not be surprised if Mystery is eventually abandoned. The terrain is flat and the lift is very old. Thoughts? Charles actually mentioned the possibility of cutting a few more runs on Mystery. I believe the lift dates back to 1972. I wouldn’t be shocked to see it. I believe that right now the snowmaking lines on Mystery only run up to the midstation and are basically only used on Log Chute. Looking at topos, I would think that cutting some runs heading SSE from the top of the lift could avoid the big flat spot on White Pine, but obviously wouldn’t do anything to fix the low overall slope of the hill. I must have missed Charles mentioning that in the interview. There’s actually some nice, steeper terrain north of the current runs on Mystery that plunges down into the Poplar River valley, but I’m not sure how well it would translate to skiable terrain. Another option would be to develop terrain heading down toward the river off the NE side of Moose, well below the cliff, but the runs would be considerably shorter than what’s available on the front side of the mountain. I’m actually most excited about the expanded beginner terrain on Eagle heading down toward the lake, adjacent to the current Mogen run. Lutsen has no top-to-bottom beginner terrain on Eagle, Moose, or Mystery, and adding some would very much enhance the family experience. SSE facing slopes get punished by winter and spring sun exposure. Not a good idea IMHO. Perhaps there’s a way the that a new lift and the existing terrain on the lower part of Eagle could be reconfigured to allow for easier access from both Lower Bridge Run and Brule Run. Either way, now that Bridge is the only top-to-bottom lift on Eagle, it serves not only all of Eagle, but also returning skier traffic from Moose and Mystery Mountains, so a detachable with a higher capacity is not a bad idea. Before any work gets done on Mystery, I’d like to see a HSQ replacement for the Bull Chair. Despite what Lutsen says about how Caribou services the entire mountain, lapping on Bull was always such a pleasure and cutting across to Caribou is kind of a pain. I really hope Lutsen is prioritizing serving its existing terrain before the expansion. Ullr (opened 6 weeks late last season), Mystery (opened for this season just 3 weeks ago), and now Bridge (down since last week) have all endured extended breakdown periods. Ullr or Mystery being down is a bummer, but Bridge being down really takes out a lot of terrain and messes with circulation between the mountains. I don’t pretend to know whether there are major components that can be upgraded on these lifts to prevent these types of breakdowns, or if they’re old enough that these kind of issues are unavoidable without replacement, but I hope Lutsen is working on making the investments nessecary to prevent these extended breakdowns from happening going forward.